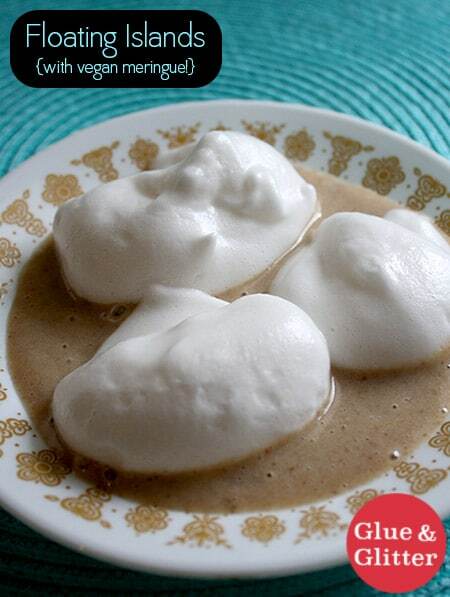 Floating Islands Recipe: Vegan Meringue is REAL! If you haven’t had floating islands, you’re in for such a treat! This is one of my favorite desserts from my childhood, and it was impossible to veganize without vegan meringue. That’s it! Some folks have added egg replacer, but it’s totally optional. The resulting meringue does have a slight beany taste, but it’s also sweet and fluffy, just like meringue should be. I am going to experiment with some other bean liquids to see how the flavor changes. Adding a little lemon juice or pureed ginger might help mask that bean taste. It’s subtle, but it’s there. This vegan meringue thing is new, so I’m excited to see where it goes! Remember how beany soy milk used to taste? This stuff takes time. There has been meringue all over my Facebook feed lately. And there are already vegan macaron recipes popping up. I like a macaron, but the meringue-based dessert that’s really nostalgic for me is called floating islands. 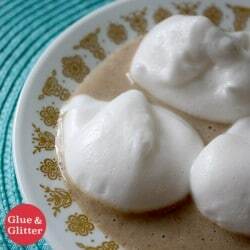 Floating islands are puffy poached meringues floating in a sea of caramel, and they remind me of visiting my granny’s village with my parents and sister. Granny Daniele lives in St. Aubin just outside of Paris, and there was one restaurant in town when I was a kid. Floating islands were always on the dessert menu, and I ordered them every time. Obviously, the day that vegan meringue happened, floating islands were my first thought. This recipe is a mashup of several recipes. Epicurious has a recipe for floating islands that isn’t quite what I remembered, but I followed that method for poaching the vegan meringue. For the meringue itself, I followed what Somer recommended on Facebook. And for the caramel, I used Veg Kitchen’s Date Caramel Sauce. So, the basic vegan meringue recipe is liquid from one 15 ounce can of beans + 1/2 cup sugar, beaten until it forms stiff peaks. When I first tried to make this, I was beating my meringue by hand, and I have to tell you, it did not work for me. I spent about an hour trying to get this to happen and even started over. The only result that I got was an intense wrist workout. Look how naive and optimistic I was! My trusty hand mixer did not do the trick. 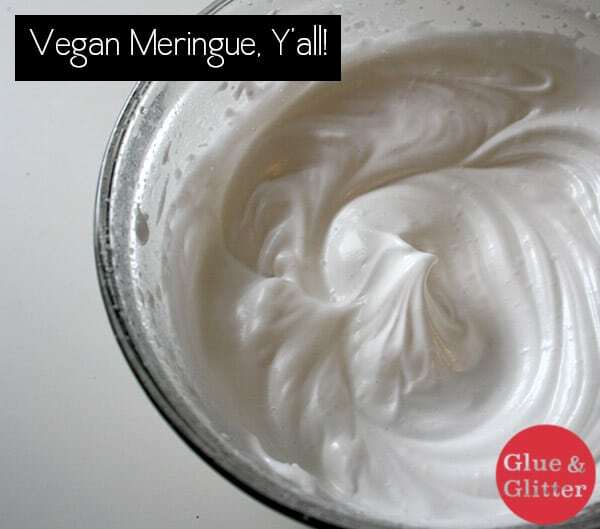 It takes a lot of beating to make vegan meringue. I don’t usually advocate for special equipment in the kitchen, but in this case an electric hand mixer is so, so worth it. I found this Hamilton Beach one for less than $25 on Amazon, and it was comparably priced at the Target by my house. You can also borrow from a friend, if you don’t want to buy and store one more kitchen item. To make traditional floating islands, you poach your meringue in milk, but this vegan meringue did not do well when I dropped it into the pan. They stayed together, but the pot kept boiling over almost as soon as they hit the milk. It was a frustrating mess. What ended up working best was skipping the poaching step and just chilling the meringue before floating it. It’s more fluffy than chewy this way, but it’s also much easier. Hurrah for skipping a step! OK! So, you’re all ready to make some vegan meringues and float those suckers in caramel, right? Let’s make some floating islands, y’all! Make the meringue: Drain the chickpeas, reserving all of the liquid. I did this by putting a glass bowl underneath my colander. Stash those beans away, because you are done with them for now. You can use them to make some hummus later. 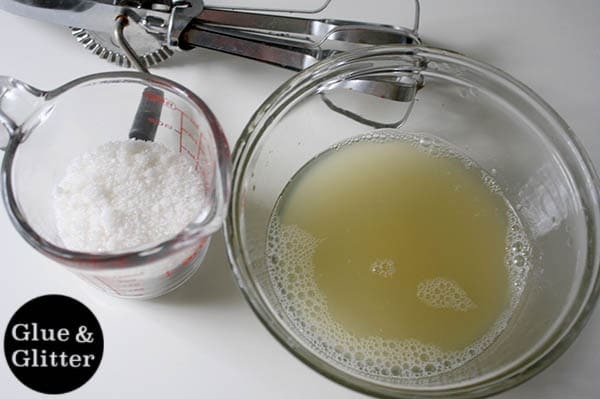 Pour the chickpea liquid and sugar into a large bowl, and use an electric mixer set on high to beat until you’ve got stiff, shiny peaks. This takes 10-12 minutes, so be patient! Stick your bowl of meringue in the fridge to chill until just before serving. You should chill your vegan meringue for at least an hour. Make the caramel sauce: Once the meringues are chilled, you’re ready to make your sauce and serve! Drain the dates, then put them into your blender with the soy milk and vanilla extract. Puree until smooth, adding more soy milk – 1 tablespoon at a time – as needed. You’re going for a thinner sauce the consistency of pancake batter. Float those islands! Pour about 1/4 cup of the sauce into a small plate, and float a few tablespoon-sized scoops of the meringues you made on top. Serve immediately. This recipe is part of the Virtual Vegan Linky Potluck #32! Try microwaving the meringues. Chef Hubert Keller did that on his show. He piped the meringues directly into the microwave’s turntable. Microwaved 4 seconds at a time. I don’t know how many 4 second intervals he used, it was short. OH MY GOSH. I have got to try this! Hi, please to see this delicious recipe ! Just to inform you that I discovered the chickpeas’ white and that you’ll find some more recipes from my blog, even this floating island, and I’ve one that you can bake ! 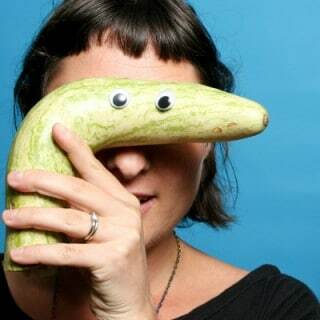 (www.revolutionvegetale.com). What I was wondering – do you have any idea how many calories are in the brine? Oh man, I don’t. I’d imagine that the calories in the brine are negligible, but I’m not certain. Fwiw, from what I’m reading this works bc the brine has a similar protein profile to egg whites. So maybe along those lines calorie-wise too? But that’s just me guessing! The instructions say “pour the chickpea liquid and water into a large bowl”. Is the water suppose to be the sugar? The only water in the recipe is the water the dates soak in. Also, can you make the chickpea liquid airy just by whipping it or must the sugar be added to it? Thank you for your help and your great post. Whoops! That should have read “chickpea liquid and sugar.” All fixed up! You don’t need the date soaking water, though you could save that to use in a smoothie. Thank YOU for sharing your awesome meringue breakthrough. There is so much goodness happening in the vegan dessert world right now! What a fabulous use of the meringue Becky!! I’ve never had floating Islands but I’ve seen them in classic French cookery books floating in custard and on master chef!! I will try this for sure – all these possibilities! I find adding vanilla removed/masked the beany taste!! Hurrah! My recipe isn’t super authentic, because my memory is of them floating in the caramel sauce. But it’s yummy for sure! Oh man. Do you remember what she used? I’m a little bit meringue obsessed right now! I think egg replacer, but it’s in her cookbook, Vegan Desserts. I’d have to hunt through piles of recipes to find it. Ooh I will see what I can see! Oh man, please report back if you try it! GIIIIIIIRLLLLLL rock on! Those look amazing. And I love the dang simplicity! Thank you, Jes! Let me know how your meringue adventures go!